Enroute to the Rockies a few weeks ago, we spent a few days in the Lower Mainland visiting my family there. 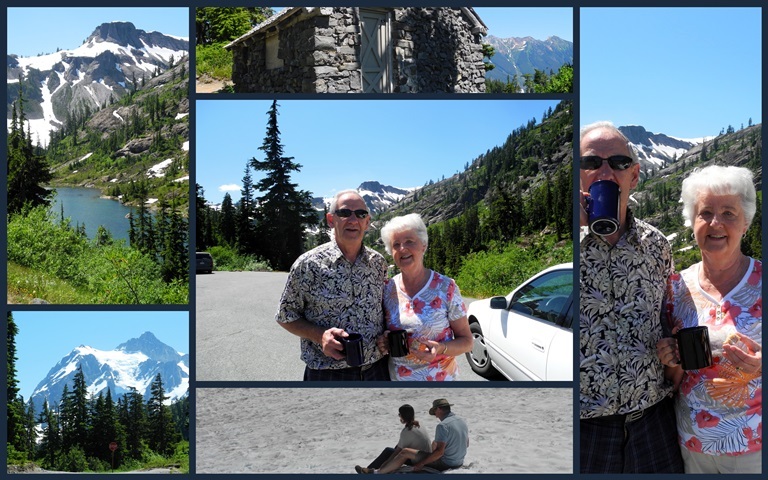 My parents took Tim and I, along with our youngest daughter (son-in-law had to work) to Mount Baker, just across the border. Beautiful day with beautiful people. We picnicked in a parking lot because we didn't find anywhere else suitable. However, just up the road were some lovely spots with tables. Next time. I asked my parents to pose with their mugs of tea - they drink tea with every meal, except breakfast when my father drinks coffee. Tea in the mountains, tea at the shore. It's a good thing. The small photo at the bottom shows Tim and Ashley trying to slide down the snow on Mount Baker. My mother, ever the good sport, let them use her vinyl picnic tablecloth as a sled. They had a lot of fun even if they didn't go very fast. The snow was too wet. Today is my mother's birthday. Isn't she lovely? Happy Birthday, Mom! Your right, a beautiful day in a beautiful place with very beautiful people. Lovely views of Mt Baker and a fun outing with the family! The snowcapped mountain is a gorgeous scene. Lovely images! Your mom is beautiful and you look a lot like her, Lorrie. Happy Birthday to her. She is lovely indeed and you look a great deal like her! Happy birthday! And she's got to be a wonderful grandmama to allow her grandchildren to use her tablecloth for sledding. Nice of your parents to pose with their tea against the gorgeous backdrop of scenery. Wishing her a happy birthday, 39 again? Your mother is very lovely. Happy Birthday to her! :) I enjoy your mosaic posts. What lovely scenery! Happy birthday to Mom! There you were on our side of the line! Love to see these photos of your parents. I have fond memories of my parents and relatives at beaches in Southern California with their thermoses of hot tea! Your mother is lovely...a very happy birthday to her! As a tea drinker, even in the morning, I can only applaud . . . and wonder what beautiful spot I should be drinking my tea in! Happy Birthday to your mother...and she is indeed lovely! How wonderful that you were able to spend some family time together on your vacation! I can see what a delightful lady your mother is. It must have been a refreshing family time for you all. Isn't it annoying how those picnic spots are always found....just too late! Looks like a great time. Happy Birthday to your mom! Wow, that picture of the Rockies is amazing! Great pics! Happy birthday to your mom! She does look so fun and so cute! Can't believe there is snow anywhere today! ha! I love to see photos of family fun. Happy Birthday to your mother. Thank you for your wonderful comment. I love your blog and will be adding it to my blog list. Happy Birthday to your lovely mother! Gosh, those mountains are breathtaking! Fabulous shots of family fun in a gorgeous landscape. What a beautiful way to spend a birthday! Wishing your mom a blessed and very happy birthday! Happy Birthday to your lovely Mother. What a fun mosaic. Thanks for sharing the trip with us. In ref. to the golden rain tree, it is green but has the yellow flowers in June. Aren't those mountains something else. A very nice mosaic. Your Mom does look like a lovely woman, Lorrie. I hope she has a very happy birthday! This looks like a wonderful outing --I'm surprised there is still snow on the mountain! You mother is lovely. And I love that they drink tea even at a picnic. Great pictures of your parents! Looks like you had a wonderful time with your family. Belated birthday greetings to your mom! She sure is pretty!